Attach a specimen record to a publication via citation. NOTE: Before a specimen is cited, the Publication profile must already exist in Arctos. See How to Create a Publication for tutorial. In the results screen, the publication title will appear with multiple links below it indicating different actions that can be performed. 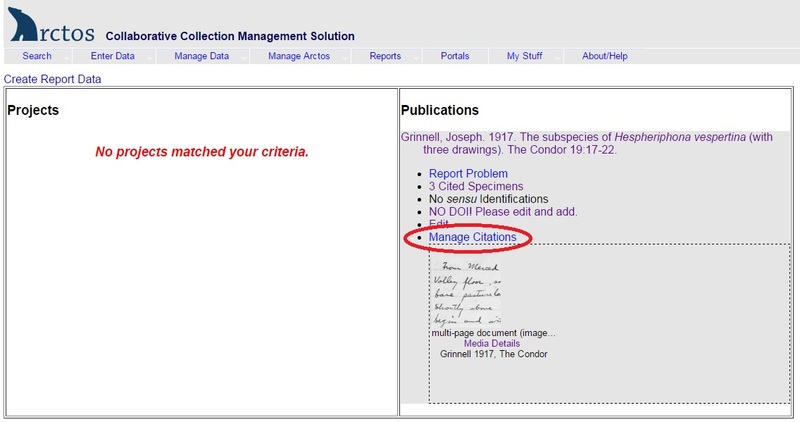 Click on the “Manage Citations” hypertext. Select the basis of citation (e.g., voucher, holotype, basis of illustration). Values are controlled by a code table. Record any relevant remarks. These will be displayed. Use the fields to search for the specimen record to be cited (GUID or catalog number). Once you click the “Find Specimen” button, a “working with specimen” link to the record queried by the search appears. The identification data associated with this specimen record is populated into the Identification fields below. Click on the “Create Citation with this Identification” button if the existing identification is the same as the identification referenced in the citation. If the specimen is cited under a different identification (e.g., a name that has been synonymized), use the “Create a New Identification” fields and click the “Create Citation and Identification” button to save. The citation is now created and listed at the bottom of the screen under “Existing Citations” where it can be managed (deleted, edited, cloned). After refreshing/waiting a few minutes, you should see the citation and publication information in the associated specimen record(s).